The annual May Day March for International Workers' Day will take place this year on Saturday 2nd May. Groups gather at Rubislaw Terrace from 10.30am, for 11am march off. Aberdeen Universities UNISON branch will have our new banner there, so please just look for it and join the group! The march will progress down Union Street to a rally and speakers at Castlegate from 11.45am. Come along and support this important event! 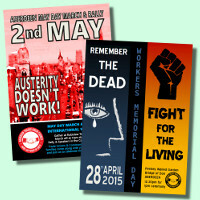 Download the May Day 2015 Poster. In this time of austerity, it is ever more important to protect our Health and Safety legislation, which is constantly under attack. The Aberdeen ceremony will take place on Tuesday 28th April at Persley Walled Garden, Bridge of Don, Aberdeen, meet at 12.30pm for the ceremony at 1pm. The ceremony will take approximately 30 minutes. Everyone is welcome and invited to attend. Download the IWMD 2015 Poster.